The title of the latest CG family comedy doesn’t leave you in too much doubt about the film’s subject matter (clue – it’s about robots) and it’s a fairly neat concept to spin an animated adventure around. 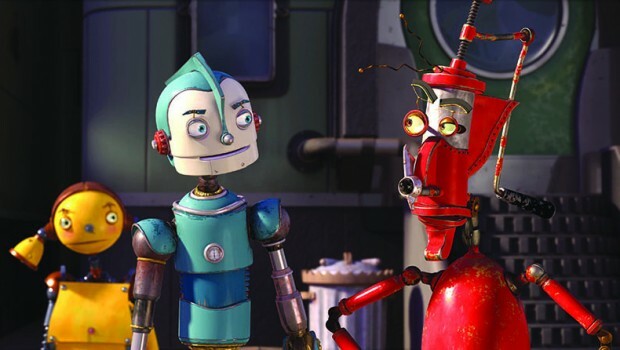 Idealistic small town ‘bot Rodney Copperbottom (McGregor) leaves his folks and heads for the great, sprawling metropolis of Robot City to make a name for himself as an inventor. Once there he finds that far from being the place where dreams come true, the city is actually in the grip of a ruthless corporate tycoon named Ratchet (Kinnear). Ratchet, under the guiding eye of his monstrous mother, is in the process of outlawing spare parts so that expensive “upgrades” become the only alternative – which pretty much consigns the more impoverished robots to the scrap heap. So Rodney and a motley crew of ‘bots – including the wisecracking ‘scavenger’ Fender (Williams) – set about bringing an end to Ratchet’s unscrupulous reign and attempt to return Robot City’s imprisoned founder Bigweld (Brooks) back to his rightful place. You could view Robots as a pointed satire on America’s current unchecked corporate culture or as an indictment of the vast social inequality of modern city life but, well, it’s probably best to view it is a bright and breezy kids’ movie. Suffice to say that you know what to expect by now. Shrek was a fairytale world that strangely resembled our own, Shark Tale was an underwater world that strangely resembled our own and Robots is, yup, a robot world that strangely resembles our own. A finely realised robot world mind you, with painstaking attention to detail and a convincing depiction of a whirling, thriving daily city life. It’s nice to see Robots released simultaneously at IMAX cinemas as well as conventional cinemas, because the multi-layered visuals and spectacular set pieces of this kind of film really do deserve to be seen on the hugest screen possible. From domino surfing to ball bearing skating and high-speed pinball-tube journeys, the film still manages to push the limits of what can be achieved within computer animated. Aside from the visuals, one of the most remarkable things about Robots is just how cheesy it is. From Robot World’s slogan of “You can shine no matter what you’re made of” to the generous round of hugs and sermonising at the finale, some of the sentimentality sticks in the craw even for a kids’ movie. Yeah, so Ice Age – Chris Wedge’s previous movie – was a tad corny too, but it had enough bona-fide hilarious scenes to compensate. While Robots does have its fair share of mild chuckles, it mainly exists on enough groan-worthy puns to fill a lifetime’s supply of Christmas crackers. “Britney Gears”, “I’m a little rusty”, “Making the baby’s the fun part”… OK, ENOUGH ALREADY! From Toy Story to Shrek, it’s the merchandise-spewing characters that can make or break this kind of movie. After all, Toy Story would just have been a gimmicky kids’ film without the wonderful dynamic between Woody and Buzz or the host of hilarious supporting characters. In this respect Robots unfortunately disappoints. Copperbottom is an alarmingly bland hero while most of the all-star cast are so dull and indistinct that you probably wouldn’t recognise them without glancing at the voice credits first (though the robots are made to vaguely look like their human counterparts). The only exceptions to this are Mel Brooks as the large, rasping Bigweld – who it’s nice to see working again even if he doesn’t get any killer lines – and of course Robin Williams. Williams is an animated fellow at the best of times, and his turn as the Genie in Aladdin showed just how perfectly suited he is to cartoons. He wisely plays the role of Fender essentially as himself (you know, rapid fire wisecracks and impromptu breaking out into funny accents), and he’s always a joy to watch/listen to – the highlight being the amusing scene where he disguises himself as a dashing count at the Bigweld Annual Ball. To be fair, the film does try to toss in a few more larger-than-life characters like Jennifer Coolidge’s big-bottomed Aunt Fan or Jim Broadbent’s Madame Gaskett (visually, a truly terrifying baddie) but they just fail to sparkle on anything like Williams’ level. Maybe I’m being a bit cynical. Robots looks great, moves at a rapid pace and kids will love it. But the standards have been set so high by the likes of Toy Story and, more recently, The Incredibles, that Robots can never be anything other than a fun but slightly disappointing movie. And I never want to endure another robot pun in my entire life.